This perforated bear canine tooth was recovered at the site of Grubraben in Lower Austria (northeastern Austria). It was discovered during excavations conducted by the University of Kansas team and funded by the National Geographic Society. 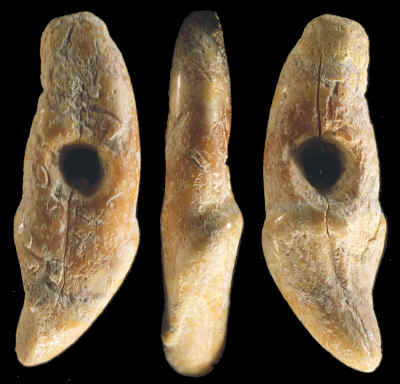 This is the only perforated bear tooth found on the site; however, there were several drilled fox teeth and large perforated stone beads also found on the site. The preferred form of ornaments found of this site were cut sections of dentalia shells, of which several hundred were found. 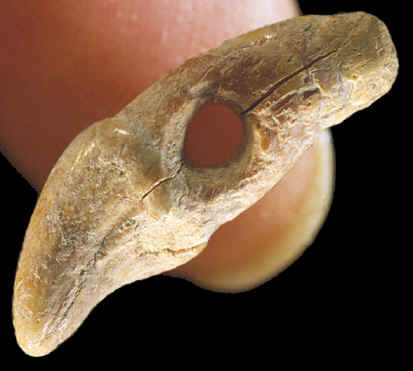 The level from which this perforated tooth was discovered dates to around 18,000 years ago. This perforated bear tooth measures 1 inch (2.5cm) long. This perforated bear canine tooth may have been used on a necklace and worn as jewelry. Or it may have been used as an ornament to adorn clothing. Small fragments of bone and eyed needles that were found on the site suggest that ornaments were attached to tailored clothing. This tooth was taken from the upper right third incisor of a bear. It measures 1 inch (2.5cm) long. The Grubraben site is located in northeastern Austria. It is a Epigravettian site that dates between 18,000 and 15,000 years ago. The site is buried in a series of loess deposits that accumulated at the bottom of a creek. Four different archaeological layers separated by layers of sterile loess were identified. The reindeer and horse hunters who occupied the site were part of a cultural adaptation that extended over north central Europe (Austria, Slovakia, northern Hungary) with possible ties to the Ukraine and Byelorussia. 1978, Jernigan, E. Wesley, "Jewelry of the Prehistoric Southwest," page 11, 168. 1988, Tattersall, Ian, Delson, Eric, Couvering, John Van, "Encyclopedia of Human Evolution and Prehistory," "Epigravettian," page 181. Personal Communication with Anta Montet-White PhD., University of Kansas.